The six state presidents of Ohanaeze Ndigbo in the Southwest geo-political zone, namely, Prince Nathaniel Uzomah, Ekiti, Dr. Femi-Ferguson Okoli, Lagos, Chief Uzodinma Iwuoha, Ogun, Chief Okecuhukwu Okorie Ondo, Chief Iheonunekwu George, Osun and Chief Emeka Enwereonye of Oyo states, recently, lamented the marginalization being meted out to the Igbo living in the other states of the southwest by the south east liaison officers. 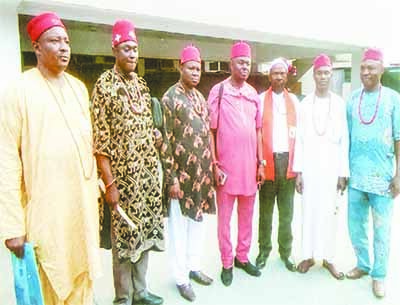 In a first ever meeting between the Ohanaeze presidents in the south west and liaison officers of the five southeast states which was held at Imo State Liaison office in Lagos and attended by the Liaison officers of Imo, Anambra, Ebonyi and Enugu states, the president of Ohanaeze Ndigbo Southwest zone, Prince Nathaniel Uzomah accused the liaison officers of concentrating their activities in Lagos State alone. According to him, the governors of the southeast states have also followed the bad precedent by behaving as if Lagos state is the only place that Igbo are living in the southwest zone. He said, the southeast governors only sneak into the other states in the southwest on private visits and never to see the Igbo living there. In the same vein, he said that the liaison officers hardly leave Lagos state to go to know how Igbo in the other states in the region are faring, adding that because of this, Igbo living outside Lagos state don’t know the functions of the liaison offices, let alone benefit from them. Prince Uzomah appealed to the Liaison officers to know that Lagos State is not the only state in the southwest that Igbo are living, that they should be coming to the other states to see how they are faring since they are the representatives of their state governors in the southwest region as a whole. On his part, the secretary of Ohanaeze Ndigbo, southwest zone, Chief Iheonunekwu George said that the present economic recession is impacting negatively on Igbo youths living in the southwest zone.. He appealed to the governors in the southeast to try as much as possible to be empowering the youths and the womenfolk. According to him, in 2014, Ohanaeze Ndigbo Southwest zone gave 12 Igbo students living in the south west,two each from the six states scholarship to study in the university. However ,he said that the laudable venture which the organization embarked upon is now been threatened by lack of fund . He appealed to the southeast governors and other well meaning Igbo sons and daughters to come to their aid so that the students would not withdraw from the university due to lack of fund. Responding, the Liaison Officer of Imo state who also facilitated the meeting Chief Steve Asimobi, commended the presidents of Ohanaeze Ndigbo in the southwest zone for the unity that is existing among them. Asimobi who is also the chairman, Southeast Liaison Officers forum in Lagos said that what Igbo need to progress in their various field of human endeavour is peace and unity. According to him, the meeting between Ohanaeze presidents in the southwest and the liaison officers would be regular since it would enable the liaison officers to know how they are faring in their various states in the southwest for onward transmission to their various state governors.. He also promised that since the jurisdiction of the liaison officers covers the whole of southwest states, they would ensure that what ever programme they are doing in Lagos would be replicated in the other states in the south west. He also promised that they would try to be making their principals available to the Igbo living outside Lagos State Contributing the Ebonyi State Liaison Officer, Mrs Ogechi Anaso Kalu appealed to the Igbo living in southwest to try to be humble and law abiding,adding that some Igbo are unnecessarily loud. According to her,Yoruba have been most accommodating to the Igbo. She urged them to be respectful to their host community that have given them enabling environment to showcase their talent.